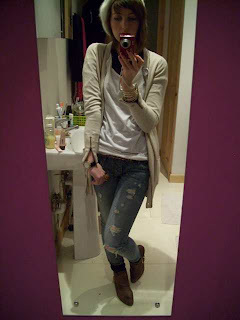 Here is todays work outfit. Work today was highlighted by a fantastic fashion mis-quotation by my friend Nutkins, to wit: "Marc Jacobs...is he something to do with the crackers?" Priceless. 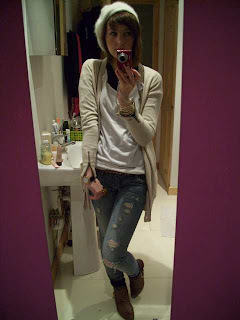 So today I wore: Cream Cardigan: Topshop, Black Studded Vest: Roxy, White Studded Slouch Tee: Roxy, Ripped Jeans: Quiksilver Womens, Socks: Pringle, Brown Slam Shoes: Topshop. 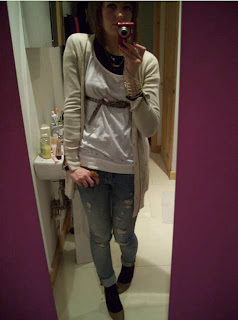 Plaited Belt: Accessorize. 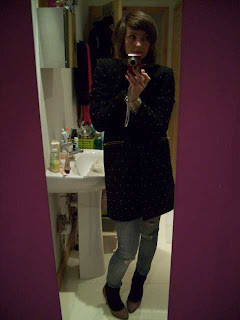 Studded Coat: Topshop. 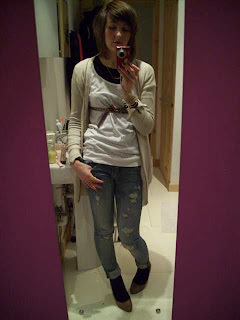 Cuff: Freedom at Topshop, Ring: Primark, Necklaces: Gifts from Friends, Watch: Vintage. 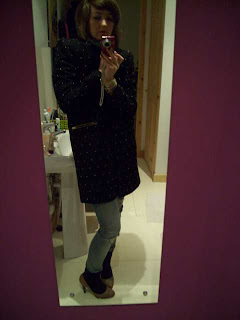 I can't wear heels for work, :( so I had to switch in my new brown Topshop ankle boots for the day.